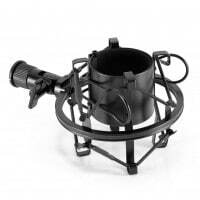 If you’re in a hurry, check out our top pick, Microphone – MXL 770 Cardioid Condenser Microphone. Recently, we published a guide on best podcast microphones where we featured both entry level and professional level microphones with price range from $50 to $500. We receive a lot of requests to share other essential podcasting equipments too that are required for a podcasting studio setup. We took that into consideration and decided to create a complete podcasting equipment guide that will show you everything you need to setup your own podcast recording studio. What do you really need to Start a Podcast? There are many components that goes into creating a podcast from content to systems and structure but the podcast equipment is the core element of it without which you cannot create anything. There are expensive equipment that gives a recording studio level control and quality, and then there are affordable and less expensive options for those who are just starting out and don’t want to invest a lot. The first thing you should do before you start to put together your podcast studio is to decide how much money you’re going to put into it. This will depend on a few factors. First, you should decide whether you are going to podcast as a casual hobby, or if it is something that you are going to want to grow and potentially make money from. You should also consider how often you are going to be podcasting, and what sort of quality you are looking for and what you can afford. If you are looking to podcast casually or not often, you can get by with some of the beginner and intermediate level equipment. However if you are going to take it seriously and believe that it will impact your business bottom line, it is recommended that you invest in higher quality equipment so that you can produce the best quality podcasts. If you are new to podcasting, the best advice is to get the bare essentials and start making podcasts consistently. Once you gain some experience, you will have a better idea of what you need and how to upgrade your equipment as you go but it is always better to have the best systems in place so you can just focus on expanding and scaling. Now that you have a direction for your podcast, it is time to go over equipment that you will need. The three things that you will need at an absolute minimum are microphones, headphones and recording software. Below, we will list all types of equipment you might want, and then later, we’ll go in more depth about which items we recommend for how serious you want to be with your project. You will need one microphone for yourself and if you are going to interview people, a second microphone for them. There are a few factors to consider when it comes to microphones such as the style, quality and cost. 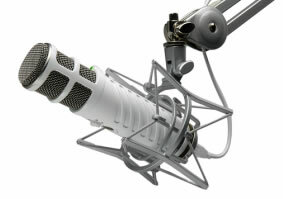 We went over podcast microphones in great detail in a previous article which you can find here. For a quick review, we would recommend Blue Yeti or Audio Technica microphones which will run you about $150 each. For advanced podcasters, you can go with Rode Podcaster or Heil pr 40 microphones which will provide you with better sound quality. Headphones are easy to overlook but they are a critical component of putting together a solid podcasting studio. A good pair of headphones will allow you to cancel out noise in your environment so you can focus solely on the audio that is being recorded through them. Headphones are essential because without them, you will be blind to any noise issues or audio level drops and changes that may be too difficult to fix in the post-production stage. You have a ton of options at your disposal when it comes to podcast editing software. There are a lot of great options and to best one for you is usually the one that you can learn how to use the fastest. If you are new to podcasting, you should stick with a simplistic program. As you get more experience, you can work your way up to more advanced editing software. 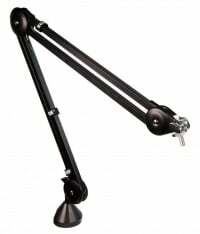 Unless you and your guests want to hold their microphones up throughout the entire podcast, you should invest in microphone arms. In fact, they are an essential part of any podcasting studio. Microphone arms are important to keeping a consistent sound level throughout the podcast as your guest moves around. It also allows them to be more comfortable throughout the recording. A shock mount is used to fasten the microphone to the microphone arm and helps eliminate any noise that comes from vibrations or contact with the microphone or mic arm. For example, if you hit the arm with your hand, the vibration will travel through the arm and into the microphone without a shock mount. 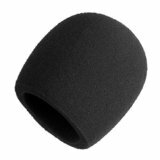 A pop filter is used to prevent the loud popping sounds that are caused by fast-moving air that blows onto the microphone. This will commonly occur during speech when people are breathing in the direction of the microphone or pronouncing the letter “P” in particular. A pop filter is basically a layer of fabric that is placed in front of the microphone to block the airflow from reaching it without blocking any of the sound. They are fairly affordable. The important thing here is to ensure that it is large enough and can be positioned at different angles so that it can block all of the airflow to the microphone. 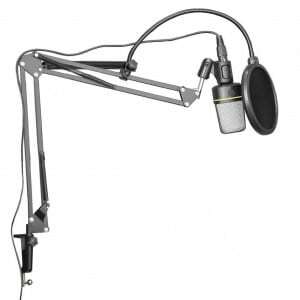 Other names for a pop filter include a windscreen, or if you are using a hand-held mic, a foam ball. You can have the highest quality microphones, headphones and best software around, but you will always have to battle the external audio interface that leaks into your podcast recording. If you want to produce the highest quality podcasts, you have to be able to manage or eliminate this external noise. Noise like this will distract the listener from your content and make your otherwise great podcast difficult to listen to. You can reduce audio interface using shock mounts, pop filters and a good mixer. Mixers allow you to have a lot more control over producing your podcasts. With a mixer, you can increase or decrease the volumes of different frequencies and produce an overall great a podcast that has the best possible sound quality. It takes a little time to learn how to use a mixer, however, it is a must have tool for any serious podcaster. If you are going to do any podcasting on the road, you should invest in a portable digital recorder. You can also get away with using your smartphone; however, digital recorders will be able to last longer before running out of batteries and provide you with a higher quality recording. As mentioned, if you want to start podcasting to see if it is something you enjoy and would like to put time and resources into, it would be best to start out with a very basic beginner setup. The bare minimum this studio would include are a low-level USB microphone with a pop filter, headphones, and recording software, but we also suggest using a portable digital recorder, a shock mount, and a mic arm/boom arm. Our recommendations are below. At $80, this is a solid little microphone and, as a bonus, it already comes with a shock mount. The tone is warm and pleasant to listen to, and it competes with some other more expensive microphones out there (for example, the Shure SM-32, which is a standard in live performance). For a low price, it’s got a solid bass range, the treble is very present, and it comes with a preamp, which makes mixing a little easier. These headphones have been compared to Beats by Dre in quality, but are at around 10% of the price. They do not cancel sound, but they certainly dampen them, and are known to be solid in both the bass and treble ranges with a solid middle, too. They’re soft and lightweight and sell for $17 on Amazon, which is a steal. If you’re just starting, you don’t need to spend any money for mixing interface software or recording devices; you’ve probably got them already on your computer or phone (and if you don’t, you can download them for free). The two basic options that are most common are Audacity and GarageBand. Audacity is the best software to use if you are just starting. You can get it for free and it will provide you with all of the basic tools that you will need to put your podcast together. To use Audacity, you will have to record the podcast on to the software and make the edits through it before exporting the podcast. It can be used on both Windows or Mac operating systems. If you have a Mac, you can check to see if it has GarageBand preloaded onto it. If not, you can purchase it for around $15. It is on same level as audacity but users say it is a little easier to use if you are just looking for the basics. As for external recording, most phones — smartphones or older — have a sound recorder pre-installed. The amount of recording that can be done depends on storage space on your phone and default audio quality, as well as the quality of your phone’s microphone. Headphone amplifiers are really only necessary for monitoring when you have multiple people recording or editing in one studio at the same time, but if you are doing that, it is very necessary. 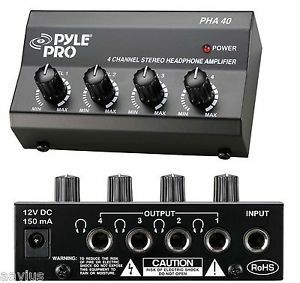 This particular amplifier runs for $20 on Amazon and has four output channels that each can control their own volume level based on the master volume coming from the computer or mixing board. The foam ball should be used if you are using a hand-held microphone. It slides over the top of the microphone and will fit just about any size. You can get them for only a few dollars each, but they will not last forever, so be sure to grab some extras. That said, many microphones now have the option of coming with a pop filter, so check those out when purchasing your mic. The Neewer Universal Microphone Shock Mount encases the microphone and reduces any vibrational noise that could travel to it. It can fit most sized studio microphones up to 50 mm in diameter. It clamps onto the arm and securely holds the microphone in place. You can get this from Amazon for around $10. The Wild-us microphone arm is a great place to start. It can be clamped to any size deck or table and adjusted from in 16”to 32” height. It can be turned clockwise or counterclockwise and adjust to the height that you are most comfortable with. You can purchase it on Amazon for only $15 each. 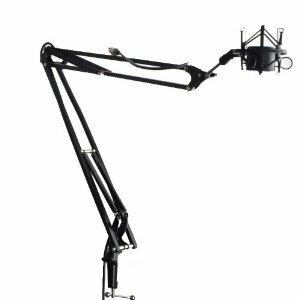 This is a great starting microphone arm to use until you are ready to upgrade. Have you decided that you do enjoy podcasting and find it worth it, but don’t want to spend a whole lot for a better sound? You might be surprised at how a small jump in price may make a large difference in quality. This equipment can be a little pricey, and a little more complicated, but if you put in the time, you can make it work well and will hear the difference. The Yeti is somewhat more expensive than the introductory microphone we suggested, at $130, but it is considered by many to be the standard podcasting microphone. It has four different sound settings, a headphone jack for monitoring, and works with a large variety of computer operating systems. Bonus: it also comes in a couple of really slick color choices! The only downside is that it is rather larger and heavier than many microphones, so it is less portable if you go on the road. The Audio Technica M50x headphones will be able to provide you with the best sound quality for the price. They are currently the number one seller on Amazon in its category and have a 4.7 out of 5 star rating from customers because of how well they work. These headphones offer a large frequency range and great bass response which is perfect, especially if you want to incorporate music into your podcast. Right now they are being offered at a 35% discount on amazon which you can get from below. 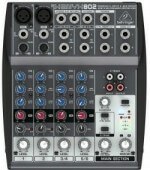 The Behringer Xenyx 802 is the current bestselling mixer on Amazon because of its functions and affordable price. It is a fully analog mixer that can adjust all sound levels using the analog dials. It has a 3- band equalizer which is ideal for music and has a fader FX for each channel to connect external devices. It provides you with all of the basics that you need in a mixer. At $65, it is a great value. 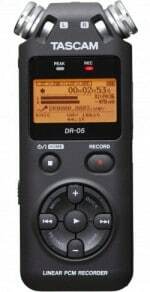 The Olympus VN-7200 Digital Voice Recorder can record for over 1000 hours and record or playback at different speeds. It is small and easy to carry around and can be used when you want to make a quick recording and is very affordable at only $28 on Amazon. It’s perfect to have as an emergency recording device for the times that you might need it on the road or by surprise — so it pairs well with the Yeti, which we mentioned is less portable. 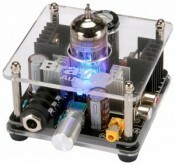 This amplifier is high-powered, reaching up to 30db. It has multiple stereo outputs and plays loud and clear with a crisp sound. It runs $70, but you won’t be skimping on quality for those times when you have multiple people recording at once, which provides a reliable volume level for monitoring your sound in the moment. This $13 filter has an adjustable arm that can clip onto the microphone body, the mic stand, a desk, a table, a chair, literally wherever is best and most convenient to prevent popping in your sound. The downside to the Yeti microphone that we suggested before is that it is quite large, and so it will not fit in a great number of microphone arm stands. 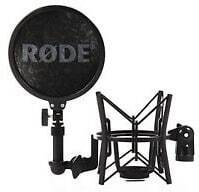 This one is low in price — also $13.40 on Amazon — and is large enough to accommodate many different microphone sizes. 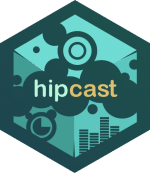 Hipcast has a similar interface to Audacity, with two major differences: it is cloud-based, rather than a software download, and it has a means to publish directly (Audacity requires you to export and upload externally to a podcast hosting site, such as Podbean, and needs a patch to be able to export to mp3 format). Skype is a great way to record with other people remotely, and the sound quality is clear, but it does come at a cost. There is a higher overhead cost for this intermediate set-up than there is for the beginner set-up, and of course, elements can be swapped out and switched around if you desire. This group of equipment can give you a really excellent, middle-of-the-road quality sound, which is perfect for people who like good sound and a clear delivery of content. 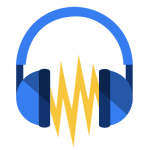 Maybe you know you like podcasting, or perhaps you want to jump in seriously with professional-quality audio, but don’t know how to go about upgrading or want to hear a variety of opinions. Below, we list industry standards for podcasting that are used often by professionals in the field. The Rode Podcaster comes in at $180, and is small and mighty. This USB microphone boasts a tight cardioid pattern to eliminate external noise and broadcast sound quality, and has a lot of bells and whistles like direct headphone output with sound control on the body and an internal capsule for shock mounting. It’s said to be the best you can get for under $200, and walks its talk. It’s also much smaller than the Yeti, which is a plus. 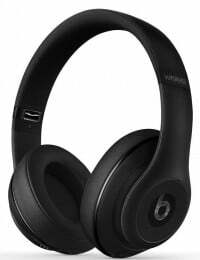 The Beats Studio Over-Ear Headphone by Dr. Dre are specially designed to eliminate virtually all noise coming from your environment. It amplifies particular frequencies to cancel out exterior noise to provide you with the most isolated quality possible. They are easy to transport and are ideal if you will be doing podcasts on the road in noisy environments. You can get them for $349 on Amazon. Mackie Mixers are extremely versatile and great for use in the home podcast studio, on tour with bands, or setting up in a theater. 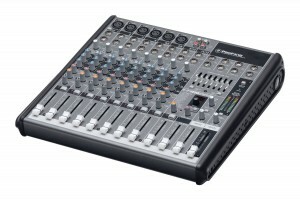 The Mackie PROFX12 mixer is perfect for advanced podcasters and experienced audio mixers. It offers more precision and options to customize audio levels exactly how you want them. 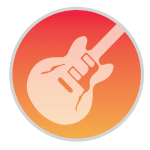 It is mainly used for musical mixing, but has anything you could ever need to use for an audio podcast with a full range of adjustments for tone, gain, pan, and everything else. It is being sold on Amazon for $229.99 and has a 4.6 out of 5 star rating. The TASCAM DR-05 Portable Digital Recorder is a high-quality digital recorder that will provide you with some of the best sound quality that you can find from a digital recorder. It has omnidirectional microphones which will be able to pick up stereo sound and is perfect for interviews that have multiple keep people talking from different directions. It has and mic input jack so you can connect your microphone to the device as you use it. It has a 4.3 out of 5 star review rating on Amazon and is being sold for $94. This headphone amplifier is very pricey, coming in at between $700 and $800, but it is unparallelled in its ability to create a beautiful sound from the line level up and distribute it to more than one source. With this, headphone quality almost doesn’t matter! It does, however, occasionally require some external gear to operate, so make sure you research whether it is compatible with your computer before purchasing. This item is $60, so it is more expensive than some of the others combined, but it integrates the pop screen and the shock mount into one convenient product that the Podcaster mic fits right into. It is made of a sturdy material, is extendable, and is worth the price if you can afford it. Again, this mount is made specifically for the Podcaster mic, but it can work with many other microphones (Yeti likely excluded due to its size). It has multiple different adjustments available, can hold up to 4.4 pounds, and has two desk mounting options. A huge bonus is that it is designed so that the angle of the microphone is the same no matter what position you’ve put it in, and it clocks in at $90, which is cheaper than some comparable mic arms. Propaganda scores perfectly on almost all categories. It has a very intuitive interface, is easy to export, and is basically everything you could ever want, including many more features (the learning curve also appears to be quite steep). There is a paid version, but there is also a free version that you can toy around with and decide for yourself if the price would be worth it. The advanced set-up is, of course, expensive and nuanced, but if you have decided that this is the field for you, it is well worth it to release a well-polished product that is sure to please, given you’ve researched your content just as well as you have the audio equipment. Overall, there is a whole lot of variety when it comes to quality, nuance, and price. 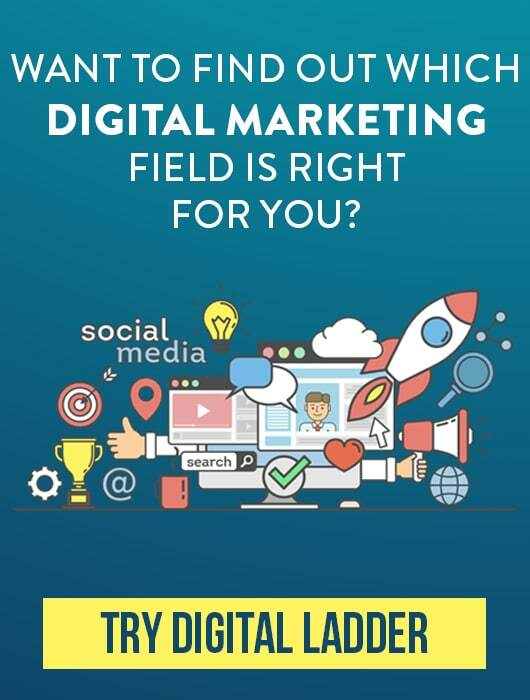 These recommendations are generalized for what sort of podcasting you would like to produce, as well as the taste of your projected or actual audience. Ultimately, it’s a personal decision to determine how much you would like to spend and which items you believe interact best with each other — sound is extremely subjective! Go forth and podcast. And good luck!